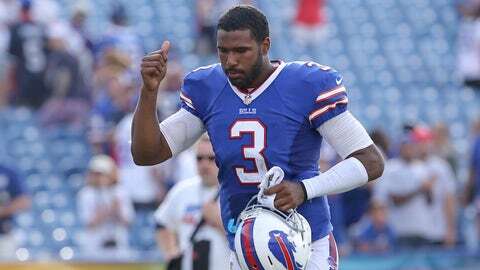 Jim Kelly hopes Buffalo fans don't give up on EJ Manuel too soon. It’s been a rough rookie season for Bills quarterback EJ Manuel, but Jim Kelly is telling the Buffalo faithful to be patient with the kid. "There are so many things a young quarterback has to learn, and there’s only one way to do it: by being out there," Kelly told the Toronto Sun this week. "You can’t learn by standing on the sidelines and just staring." Manuel is closing the season much like he opened it, facing questions about yet another knee injury. Manuel is out after being hurt in a 27-20 win at Jacksonville last Sunday. Coach Doug Marrone said Manuel should be healthy enough to play in the season finale against New England the following weekend. It’s the third time Manuel has been sidelined since training camp because of knee issues. The injury is to the same left knee that forced the first-round draft pick to miss the final two preseason games. "Training camp for a rookie quarterback is so, so essential," Kelly said. "It’s where they learn. It’s where they can make their mistakes. It’s where they really get to know their receivers, their running backs, and their system. He missed half of that. "The mental approach at quarterback is so key. And for a young guy coming in trying to master a playbook that’s five times thicker than a college playbook, and the defenses with all the ways they disguise, it’s a tough transition even if he never gets hurt." Manuel also has missed four regular-season games because of a sprained right knee. The Bills (5-9) have been eliminated from playoff contention. The Dolphins (8-6), meanwhile, control their own playoff chances. Miami, which has won three straight and four of five, can clinch a berth by winning and having both Baltimore and Cincinnati lose. "I definitely think EJ is doing a good job," Kelly said. "There are times, yeah, where you think, ‘What’s he doing?’ or ‘That mistake shouldn’t happen.’ But I think he’ll get better, and when he gets another year under his belt, he’ll be all right."